For example, the video effects categories are similar to earlier versions: Basics, Blur, Custom, Distortion, Keying, Light, Looks, Stylize, Tiling, but the audio categories are more extensive: Distortion, Echo, EQ, Levels, Modulation, Spaces, Specialized and Uncategorized. There's also clearer indication of potential audio peaking and Avid-style representation of audio waveforms. The UI overhaul feels like the change from System 9 to OS X (co-incidentally reflecting the underlying architectural change). If you take a close look at the 1920 by 1200 UI at [www.loopinsight.com] ...you'll see that although the UI seems dumbed down, there's enough complexity in the buttons and controls. There was always going to be a break in UI from 20th to 21st century. For those used to multi-track editing in Soundtrack Pro, this shouldn't be too much of a leap. If the new version of Final Cut isn't for you, Final Cut 4.5-7 still work as well as they ever did. Note that there's a filmstrip-labelled button at at the lower-left of the screen - maybe that will allow you to turn off the clip previews - useful if you think the 'iMovie-like' UI is turning you into an amateur. Everyone is making detailed speculation judgements too darn soon. THIS WAS A SNEAK PEAK...of a ground-up rewrite. Nobody knows anything until they try it. Right, Joey. Me? I'm not going to take any rumors seriously until I see the "official" announcement on apple.com. As of this morning, there's nothing there about the new FCP X. Which, by itself, worries me a little even more. 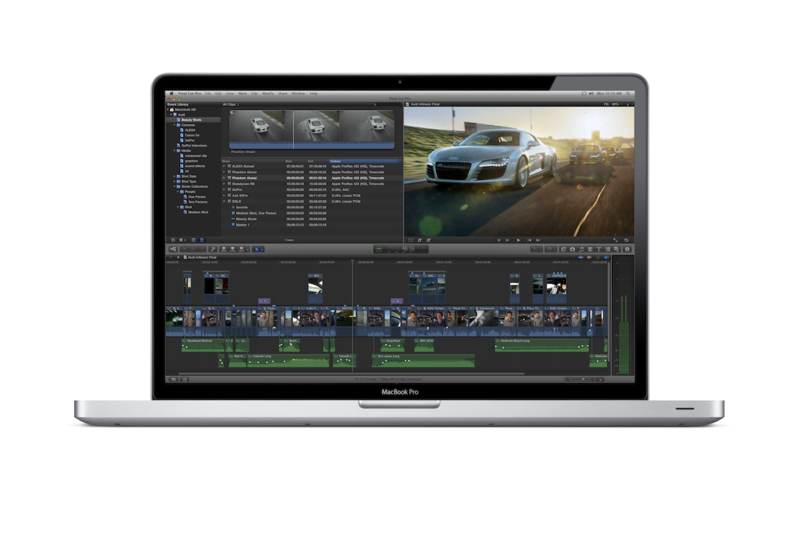 Were those guys bragging about the new FCP last night really from Apple? If this is really good, how come the site is quiet about the revolutionary, new FCP. Hey, Michael, can you help telling us what you know about it? According to Larry Jordan too many questions are to be answered. There might be quiet a few changes made before the official launch. I think the interesting thing would be to see how Adobe and Avid are viewing the whole situation. No Bruce? Kiddin'! This looks new, this looks cool and it looks and feel like Apple. And if it works as it says it does, without losing any of the existing functionalities, there won't be any debates about the NLEs. Incidentally, that is the color of my Avid timeline. And yea, so far it is jaw droppingly awesome. One thing though.. Where is the viewer? What happened to the tracks? The timeline actually looks a lot more awkward than it used to be. Yeah, I hate the thumbnails too. He now has the opportunity to compare the sneak peak with what he was shown a few weeks ago. Thanks for all the delicious pics Alex. I thought the new iMovie (8 and up) was junk too... until I started using it. It's a completely different animal than the current NLE timeline, it is made for editorial work. It lets you get your story organized and cut quickly. Last summer our shop actually starting offlineing with iMovie and then exporting to FCP for online and I can't imagine going back. We're arriving at a rough cut in less time by a factor of 2 times, if not more. (We mainly do corporate, somewhat complex interview driven pieces, with the typical B-roll, and occasional still). I think what we saw last night was an introduction to the new way to edit. Now that tape based systems are only a memory, the new FCP is forging ahead and developing a better way to edit without the shackles of "linear" based editing." I'm going to start using it to get a feel for it too. "Just to keep the record straight, at the show last night, it was VERY CLEARLY stated, that FCPX has keystroke equivelents for ALL editing commands. There was nothing said about the software being in any way shape or form any more "mouse centric" as an editing tool, and, in fact they spoke directly against that idea. Whatever else you think, this was a room of 1500+ people who largely make their living editing video. Virtually all of them were registered owners of $1000 worth of pro level editing software represented by FCP. I know a lot of people came interested, concerned, even worried about what the announcement would mean to their careers and professional prospects. In the very beginning, I watched and listened as the crowd was clearly hesitant. But literally by about 20 minutes into the show, the crowd not only defrosted, but started to literally applaud and cheer as feature after feature was revealed (along with the reasoning behind the approach that the team at Apple had taken. The last half of the show was largely ooahs, aahs, and extremely enthusiastic applause (even literal cheering!) as Apple revealed feature after feature that none of us had EVER seen implemented in quite this way in editing software before. This was NOT a pushover crowd. It was NOT simply a room of Apple fanboys. It was working editors and content creators just like me. Still questions? Of course. But while it's cute shortcut to call something iMovie Pro - only a dunderhead would see what I saw last night and reduce it to something that trivial. And finally, regarding the price point. Understand that the App store infastructure functionally changes EVERYTHING about software distribution. No boxes, no warehouse flooring charges, no transportation costs, etc, etc, etc. You click, and $300 smackers drops nearly directly to Apple's bottom line nearly instantaneously. Ask anyone in supply chain management what that really means. It's a TOTAL game changer in business models. And ONE company figured that out how to make that work before anyone else. Like it or not, Apple is simply playing the business game at a whole different level than most companies. Some will pick, and kick and resist. And yes, for some people with some business plans and some specific needs, this will NOT work the way they want it to. Sorry. But I saw something that can make my professional life a whole lot EASIER - with state of the art tools in combinations and executions that will let me do more, more simply - than I can now. I couldn't be more excited to get it on my machine. And to start using what I saw to make better videos more easily. Because that's EXACTLY what I saw on that stage last night. I don't think anyone has mentioned this yet...but FCPX DOES NOT DIGITIZE / LAY OFF TO TAPE ANYMORE!! My studio peeps are freakin' because even though we are predominantly Digital Delivery, we still have clients like ESPN and BET demand tape. Okay. Gotta take back the jaw droppingly awesome description until I hear more about it. The use of OpenCL and Grand Central Dispatch is something that I have been waiting for years, and I'm hoping they have finally made it work. We have so much processing power these days, and I would definitely like to make good use of it. I like FCP for the simplicity- I transcode when I want to, and I know what the machine likes and what it doesn't, so I can decide my own workflow. Multi format support is one thing, and sometimes I want the option to natively have the clips in it's original resolution, so I can transcode them through a Teranex or an Alchemist later on. The things that I need to know is what is the replacement for 3 point editing system (browser, viewer, canvas). The current system is pretty efficient- launch a clip in the viewer (and they can be 1 hour long "capture now" clips), scrub to the point i want, hit play, mark in and out on the fly. Then insert into the timeline. I don't want to drag the entire 1 hour long captured clip, into an hour long timeline, and muck around with the in and out points desperately trying to find the part of the clip I want. Can't cut anything more than a short 30 second ad with that. Joey, I expect that to be a given feature. Without it, FCP will be Final Cut Semi Pro. And I will find another profession or cut on the Avids. That, along with the option NOT to have auto stabilizing and auto rolling shutter correction on all clips upon ingest. We know how much analysis that takes up and how much artifacts you can get when you run optical flow correction on those shots. Gotta admit, at that price point, you will get lots of sales. Editors, producers, directors and even students won't mind getting it because it's relatively cheap, and it's an industry standard. The potential issue I'm starting to see is that they are trying to reinvent the wheel and at the same time, they may have gotten rid of the old one. Nothing wrong with the concept, aside from the fact that sometimes the wheel works better. They killed off Livetype, and I have no qualms about it, as you have other title tools that can do the job and much better. That said, a lot of questions need to be answered. We will know in time. > FCPX DOES NOT DIGITIZE / LAY OFF TO TAPE ANYMORE!! > have clients like ESPN and BET demand tape. > Something to think about. It's not a "Pro App" without Tape I/O Control IMHO. Even though we we have prediminantly converted most of our clients to accept Digital Delivery, we still crank out hundreds of tapes a year to the stubborn clients (some still taking Beta / DigiBeta). I'm not sure if they have omitted it. You NEED tapes for long form submission. Unless you loan them hard drives so you need to pay additional to courier the drives back. That or additional shipping fees. but how do I choose a (formally known as) in point and a (formally known as) out point on a rush and ... edit it ? I have been looking at the pictures, blogs and videos of the presentation in detail, and it does seem to have that iMovie thing to it, where it cannot do a simple 3 point edit. Any pros who have used iMovie for the iPhone will tell you that you do not want to cut that way. I still have a backlog of vacation videos sitting in my iPhone waiting to be edited for this very reason. You can reinvent the wheel, but keep in mind, that the beauty of the 3 point edit feature is that you can see your in point in your record monitor, and you scrub on the source monitor to find the shot that you want to cut to. Then you mark your in and out point. Being able to audition the cut is kinda cool, and this was something the linear editing machines could do because you needed to audition your edit before you hit record, as tape to tape editing was a destructive process. That said, you definitely do not showcase the 3 point edit function as a feature, but not seeing a viewer and watching only the audition feature is kinda scary.